Orange County Emergency Manager Ron Plummer, Orange County District 6 Commissioner Victoria P. Siplin, Orange County District 5 Commissioner Ted B. Edwards, Orange County Fire Rescue Chief Otto Drozd III, Orange County Sheriff Jerry L. Demings and Central Florida Regional Transportation Authority (LYNX) CEO Edward L. Johnson join Orange County Mayor Teresa Jacobs for an afternoon press briefing on October 7 to deliver Hurricane Matthew recovery updates. UPDATE October 10, 2016 1:30 p.m.
All Orange County Parks and Recreation facilities are now open. UPDATE October 10, 2016 9:00 a.m.
Due the effects of Hurricane Matthew, Orange County Parks’ Trimble Park is closed. UPDATE October 8, 2016 1:00 p.m.
Orange County’s Emergency Operations Center has suspended operations and is activated at Level 3. Normal Orange County Government operations resume on Saturday, October 8. All employees who normally work on Saturdays and Sundays will need to resume their normal duties at their usual times this weekend. Orange County Government will also be open for business as usual on Monday, October 10. CURFEW: The mandatory curfew announced by Orange County Mayor Teresa Jacobs was lifted on Oct. 7, 2016 at 2 p.m.
SCHOOLS: The Orange County Public Schools’ Board Policy Group has announced normal operations as of Monday, Oct. 10, 2016. SHELTERS: All general population shelters are closed. The last remaining Persons with Special Needs has been transferred to their homes. WATER UTILITIES: There were minimal impacts to water facilities and no outages. Only four of the lift stations are operating on generator power. As electric power restoration efforts continue, these will resolve themselves. DAMAGE ASSESSMENT: Crews are out surveying the damage. So far, there are 18 residences that sustained moderate to major damages. The Orange County Building Department is performing safety assessments on residences in unincorporated areas. Municipal building officials are responsible for theirs separately. PUBLIC WORKS: Nearly all traffic signals have been restored to normal operations. Most work is concentrating on trees down and debris clearing. TRANSPORTATION: LYNX buses are operating normally. Orlando International Airport is under normal operations. UPDATE October 8, 2016 10:30 a.m.
We will not be releasing any additional information at this time. UPDATE October 8, 2016 10:15 a.m. The following Orange County Parks are closed until further notice: Fort Christmas, Bithlo, Kelly, Magnolia and Trimble Parks. All other Orange County Parks should be open as of noon today, October 8. UPDATE October 8, 2016 10:00 a.m.
Orange County’s Emergency Operations Center is demobilizing and is activated at Level 2. Shelters in Orange County closed at 6 p.m. on Friday. Insist on references, a proper license, bonding and insurance and check credentials. For more information, read about the importance of hiring a licensed contractor. Friday routes in unincorporated Orange County are being collected on Saturday, October 8. Regular setout guidelines still apply for Saturday collection. Large items that were scheduled for pickup on Friday will be collected on Saturday, October 8. The normal service schedule in unincorporated Orange County will return the following week. Do not mix yard waste with garbage. If you have yard tree debris on your property please bag, bundle and contain the debris for pickup. Follow the curbside collection guidelines at www.ocfl.net/GreenClean2016. Limit yard waste to three cubic yards, or about one small pickup truckload, per household weekly. Use your own garbage cans or plastic bags for collection. Cans and bags must be 50 gallons or less and weigh less than 60 pounds each when full. Cans must be waterproof with a tight-fitting lid and have handles on the sides. Bundle limbs, palm fronds, and similar items with string. Keep bundles three feet long or less. Limit weight to less than 60 pounds. UPDATE October 8, 2016 9:45 a.m.
Downey Park’s splash pad is closed today, Oct. 8. UPDATE October 7, 2016 3:00 p.m.
UPDATE October 7, 2016 1:30 p.m.
Orange County Government currently has teams in the field to assess the overnight impact of Hurricane Matthew. As of, 1 p.m., 65,355 residents are without power. Duke Energy and OUC are working to restore service as soon and safely as possible. Citizens using generators should use extreme caution. Never operate generators inside a building or garage. Visit Duke Energy or OUC for more information. More than 1,400 citizens took refuge in Orange County shelters, including 80 individuals with special needs. The mandatory curfew for Orange County will be lifted at 2 p.m.; however, citizens should remain vigilant. Significant hazards, including downed power lines, trees or other debris may not have been cleared. While Public Works reports that the majority of traffic signals in Orange County are operational, however, extreme caution should be exercised. Residents are asked to report concerns to 3-1-1. UPDATE October 7, 2016 11:00 a.m.
Last evening, Mayor Jacobs announced a mandatory curfew to be put into effect for Orange County in an effort to protect the life and safety of all citizens. The curfew is still in effect, but is being assessed and an update is expected this afternoon. UPDATE October 6, 2016 8:00 p.m. 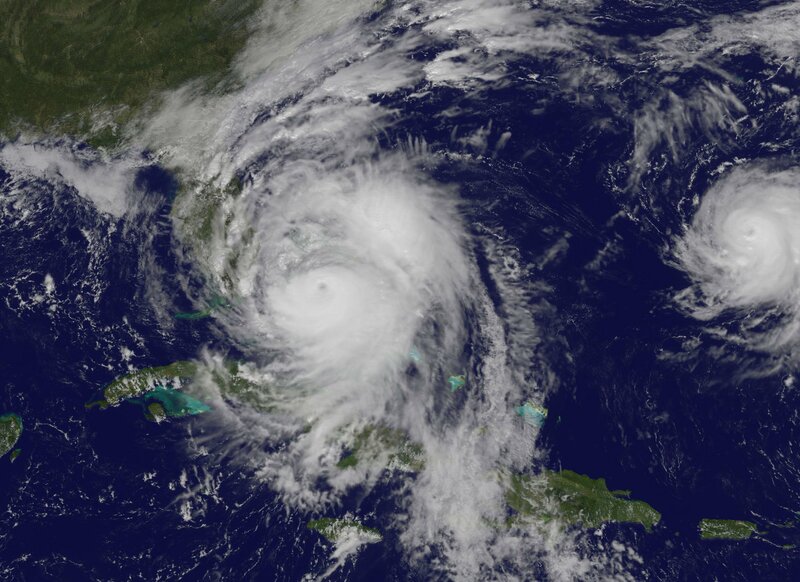 The most recent report by the National Weather Service indicates that Hurricane Matthew is once again a Category 4 Hurricane. As of 5 p.m., the forecast for Hurricane Matthew calls for Tropical Storm force winds to begin tonight in Central Florida at 11 p.m. Hurricane force winds are expected to start tomorrow morning at 5 a.m. lasting until 11 a.m. with peak winds of up to 101 mph at 7 a.m. Tropical Storm force winds are expected to end Friday evening at 10 pm. The total duration of Tropical Storm force winds will be 23 hours. UPDATE October 6, 2016 6:00 p.m.
As of 6 p.m., we have 550 citizens in our shelters. Only one of the shelters – Bithlo Park – is at capacity. Our five other shelters – Odyssey Middle School, Apopka High School, Corner Lake Middle, Timber Creek High School and Barnett Park have availability. A decision has also been made to CEASE ALL COMMERCIAL FLIGHT OPERATIONS AT ORLANDO INTERNATIONAL AIRPORT AT 8 P.M. THIS EVENING. ORLANDO INTERNATIONAL AIRPORT IS NOT CLOSED. However, passenger flights will be suspended until the weather conditions warrant and the airlines determine it is safe to fly. Passengers are advised not to come to Orlando International Airport for shelter or to wait out the storm. ORLANDO INTERNATIONAL AIRPORT IS NOT AN APPROVED RED CROSS SHELTER. It is anticipated that flight operations will gradually resume on Saturday, October 8th after the airport has undergone a damage assessment and has been deemed safe for passengers and employees after the storm. UPDATE October 6, 2016 5:00 p.m.
UPDATE October 6, 2016 3:00 p.m.
All Orange County Sandbag Distribution locations are now closed. Orange County Public Works distributed more than 78,000 sandbags to residents since yesterday. UPDATE October 6, 2016 12:20 p.m. The most recent report by the National Hurricane Center indicates that Hurricane Matthew’s current track shows possible landfall by EARLY Friday morning in Brevard County. Orange County is currently preparing for the potential of hurricane-force winds, in excess of 74 miles per hour, with gusts up to 90 miles per hour between late Thursday night, and all day Friday. It is anticipated that the east side of Orange County could experience tropical storm winds for more than 24-hours. Please see the latest announcements from Orange County as of 11 a.m.
Download OCFL Alert on your mobile device in the event you lose power, and need updated information. Orange County Mayor Teresa Jacobs issued a Declaration of State of Local Emergency which allows for additional resources to support the community. Orange County Fire Rescue Personnel are going door-to-door RIGHT NOW throughout manufactured home communities encouraging residents to evacuate to safer shelter. Last night, Orange County Fire Rescue expanded the “Code Red” Alert to all manufactured home communities in Orange County. Citizens Assistance Response Teams (CARTS) are being staged to ensure supplies and resources are in place once the storm passes. Residents are asked to be off the roads by 6 p.m. tonight. Sandbag distribution for Orange County ends at 3 p.m. (weather pending) today. After the storm, residents are asked to stay off the roads so that Orange County can complete its assessment of damage. Six general shelters in Orange County open at 1 p.m., with two being pet friendly. There are also shelters available for persons with special needs (PSN). 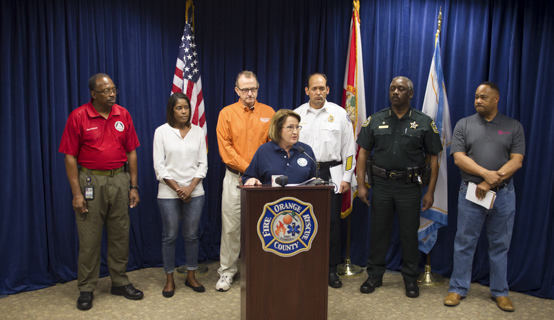 Residents MUST call 407-836-9319 for information on PSN shelters. Shelter information is posted at www.ocfl.net/matthew. Please note: Shelters will not be able to accommodate early arrivals. Shelters are alcohol, drug and weapon free zones. Sandbag distribution ends at 3 p.m. (weather pending) today. For locations and more visit www.ocfl.net/ocsandbaginfo. Goldenrod – 2530 N. Forsyth Rd. Individuals may call 407-354-5555 if they need assistance identifying rooms to meet their family’s needs. UPDATE October 6, 2016 10:20 a.m.
All commercial airlines at Orlando International Airport will stop flying as of 8 p.m. today, Oct. 6 until further notice. UPDATE October 6, 2016 10:00 a.m.
Onset of Tropical Storm (TS) Winds at approximately 1 a.m. Friday morning. The eastern 1/3 of Orange County could experience more than 25 hours of tropical storm winds. Maximum winds may be experienced across Orange County at approximately 10 a.m. Friday morning. Maximum winds experienced across the Eastern 1/3 of the County 94 mph, Central 1/3 of the County 65 mph, Western 1/3 of the County 63 mph. UPDATE October 6, 2016 9:45 a.m.
All Orange County Parks & Recreation facilities will close at noon today & tomorrow Oct. 7; all programs and leagues are canceled through Oct. 8. The Orange County Convention Center will be closed on Friday, Oct. 7. Events scheduled on Friday will be postponed and rescheduled. UPDATE October 6, 2016 9:30 a.m.
Orange County will be distributing sandbags until 3 p.m. today (weather permitting) at the below locations. Residents must be in line no later than 2:30 p.m. Residents must go to the appropriate jurisdiction for pick-up. If your street sign has a fountain logo, you may pick up sandbags until 12 p.m. noon today from the City of Orlando’s Streets and Stormwater Division at 1010 Woods Avenue. If your street sign has an orange logo, you may pick up sandbags at Orange County locations. UPDATE October 5, 2016 8:45 p.m. Provide briefing on local preparedness and emergency management efforts, including latest weather update of the storm’s path, update on shelter availability and information, transportation, sandbags, management of lakes/water management and more. UPDATE October 5, 2016 8 p.m.
Orange County Shelters will open at 1 p.m. tomorrow. For information on a special needs shelter, please call 407-836-9319. For continued Orange County updates, visit www.ocfl.net/Matthew. UPDATE October 5, 2016 3:30 p.m.
Orange County’s Office of Emergency Management is advising residents to stay vigilant and informed as Hurricane Matthew approaches the state of Florida. The latest projected storm path indicates Orange County and eastern neighboring counties may be impacted as early as Thursday evening. At this time, Orange County has activated to a Level Two, which includes bringing in additional support personnel for preparedness efforts. Activation levels may adjust as the storm approaches. Sandbag Distribution – Orange County Public Works has already distributed more than 10,000 sandbags. Sandbag distribution will continue at seven remaining locations listed below on Wednesday, Oct. 5, from 7 a.m. through 7 p.m. On Thursday, Oct. 5 sandbags will be distributed from 7 a.m. though 3 p.m. (pending weather). Residents are eligible for up to 10 sandbags per vehicle. For information and locations, visit www.ocfl.net/ocsandbaginfo. UPDATE October 5, 2016 at 3 p.m. Follow us on social media to stay weather aware as Hurricane Matthew nears Orange County. For the most up-to-date information, visit our Facebook and Twitter pages. UPDATE October 5, 2016 at 2:30 p.m. The Orange County Utilities Solid Waste Division will not collect garbage, recycling and yard waste on Friday, October 7, due to Hurricane Matthew. Friday routes will be collected on Saturday, October 8. Customers whose regular day is scheduled for Friday should plan to place garbage, recycling or yard waste at the curb when conditions are safe for collection on Saturday. Regular set out guidelines will still apply for Saturday collection. Large items that were scheduled for pickup on Friday will be collected on Saturday, October 8. Curbside collection service on Thursday, October 6, will occur as regularly scheduled. Please remove empty garbage and recycling roll carts from the curb and secure any loose items. The normal service schedule will return the following week. If the storm path projections are altered, further updates may be issued. For more information, visit www.ocfl.net/GreenClean2016. UPDATE October 5, 2016 at 2:00 p.m. Via the Central Florida Expressway Authority: Due to Hurricane Matthew, all tolls on SR 528 have been suspended until further notice. Please drive safely. UPDATE October 5, 2016 at 1:45 p.m.
All Courts in the Ninth Judicial Circuit – Orange and Osceola Counties – will be closed Thursday, October 6 and Friday, October 7. UPDATE October 5, 2016 at 12 p.m.
All schools, including the campuses of Orange Technical College will be closed Thursday, Oct. 6, 2016 and Friday, Oct. 7, 2016. All activities planned for schools on and off campus are cancelled beginning Thursday and lasting through Sunday, October 9th. We want to allow our OCPS students and families the opportunity to prepare for any impact Orange County may have from Hurricane Matthew. The district’s maintenance and facilities staff will also be preparing our school sites for anticipated hurricane conditions and the potential use of our schools needed as shelters. OCPS will continue monitoring the storm through communications from the National Weather Service and with local emergency management offices. Updates will be delivered to families and staff through our ConnectORANGE phone messages, OCPS website at www.ocps.net and through district Facebook and Twitter feeds. District offices and select facilities will remain open on Thursday but will be closed on Friday. UPDATE October 5, 2016 at 11:45 a.m.
Orange County Public Works has distributed more than 10,000 sandbags from 7 a.m. to 11 a.m.
UPDATE October 5, 2016 at 11:15 a.m. The National Hurricane Center has extended the hurricane warning through Orange County from the Sebastian Inlet to the Flagler/Volusia County line. UPDATE October 5, 2016 at 11 a.m.
Orange County’s Office of Emergency Management is advising residents to stay vigilant and informed as Hurricane Matthew approaches the state of Florida. The latest projected storm path indicates Orange County and eastern neighboring counties may be impacted as early as Thursday evening. At this time, Orange County has activated to a Level Two, which includes bringing in additional personnel to support preparedness efforts. Activation levels may adjust as the storm approaches. Citizens are being asked to finalize preparedness efforts as well to include: ensure that any loose items in yard or home are secured; make sure emergency supply kits are stocked with water and nonperishable foods enough to last 3 – 5 days. Please top off vehicles with fuel. Consider visiting the ATM, prior to any potential power outage. Check on neighbors, particularly seniors and those who may have special needs. Finally, please bring pets inside and ensure the safety of livestock. Residents are encouraged to visit www.ocfl.net/storm for the latest Hurricane Matthew information as it pertains to Orange County. Orange County Emergency Management officials are working in partnership with the Orange County School Board to identify shelters, in the event of evacuations. NO EVACUATIONS have been ordered in Orange County. UPDATE October 05, 2016 at 10:45 a.m. Visitors to the region may reference the US Foreign Consular Offices photo directory, here. UPDATE October 05, 2016 at 10:30 a.m.
Orange County Animal Services Reminds Families to Include Pets in Hurricane Prep Plans. Although Orange County is NOT under evacuation orders, residents are encouraged to be prepared for Hurricane Matthew. A list, including phone numbers of pet-friendly places. A pet carrier for each pet, in which the animal can stand and turn around. Write your name, address and phone number and include additional contact information for someone outside the area. Pet Health Record in a waterproof container (each pet should display a current rabies tag at all times). Current picture of your pet in a waterproof container and an extra identification tag. Collar and leash for dogs, and an adjustable collar for cats. Two-week supply of pet food, water, bowls, cat litter/box and any necessary medications. Plastic bags to hold contents such as pet treats and small toys. Newspapers, plastic bags, cleaner and disinfectants to handle pet waste. A cotton sheet to cover the carrier to keep the pet calm. Pet First-Aid Kit: Ask your veterinarian for the supplies appropriate for your pet. For more information on how to prepare your pet for a disaster, contact your veterinarian; call Orange County Animal Services at (407) 254-9140 or visit www.ocnetpets.com/preparedpet. UPDATE October 4, 2016 at 10 a.m.
Sandbag Distribution – Orange County Public Works will begin to distribute sandbags at all eight locations listed below starting Wednesday, Oct. 5, beginning 7 a.m. through 7 p.m. Residents are eligible for up to 10 sandbags per vehicle. For information and locations, visit www.ocfl.net/ocsandbaginfo. When making a storm preparedness list, consider the Five Ps: People, Prescriptions, Papers, Personal Needs and Priceless Items. People, pets and other animals or livestock. Prescriptions with dosages; medicines; medical equipment; batteries or power cords; eyeglasses; and hearing aids. Papers and important documents (hard copies and electronic copies saved on thumb drives). Personal needs—such as clothes, food, water, first aid kit, cash, phones, and chargers. Priceless items, including pictures, irreplaceable mementos and other valuables. For more information, visit www.ready.gov and www.ocfl.net/hurricaneguide..
Download Orange County, Florida’s OCFL Alert, OCFL News, OCFL 311, OC ALERT mobile applications for free on Apple and Android devices to receive emergency management communications and to stay informed before, during and after a storm, bit.ly/OCMobileapps.